Was fun and challenging, a bit frustrating at times, but overall - incredibly enriching and positive experience. Learned a lot during these weeks, will be back next year. I like the design, and I love your style! Can't wait to see more! It's good to see you here bro. 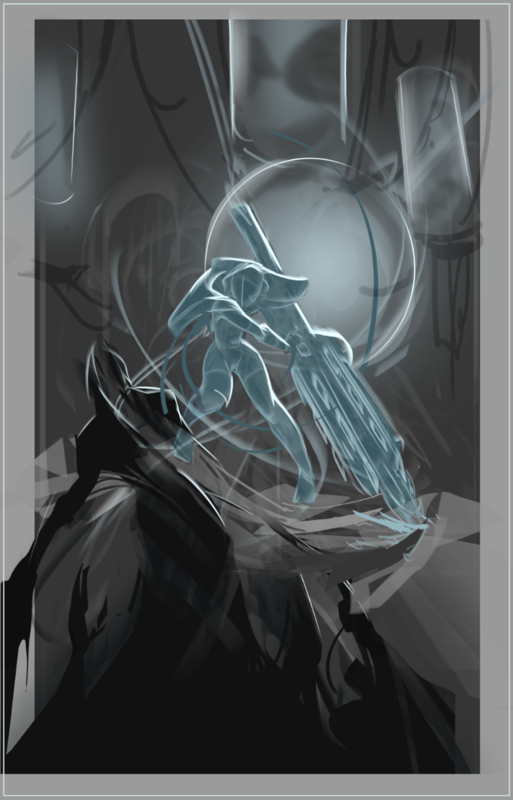 Liking the sketch so far. 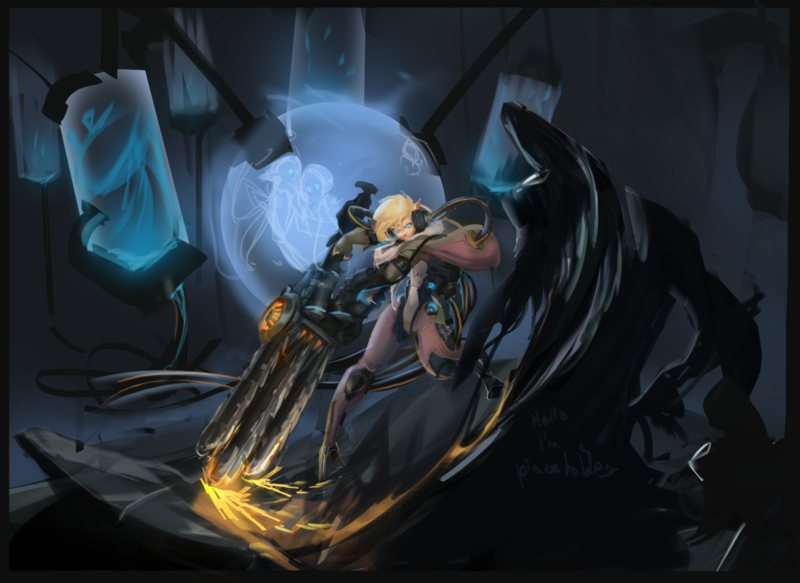 Seems like you'll be giving her some cool shield or some kind of weapon. Keep up the good work and best of luck. Good job so far! Looking forward to see more here! @sanguine Thank you a lot! @malcom Thank you! 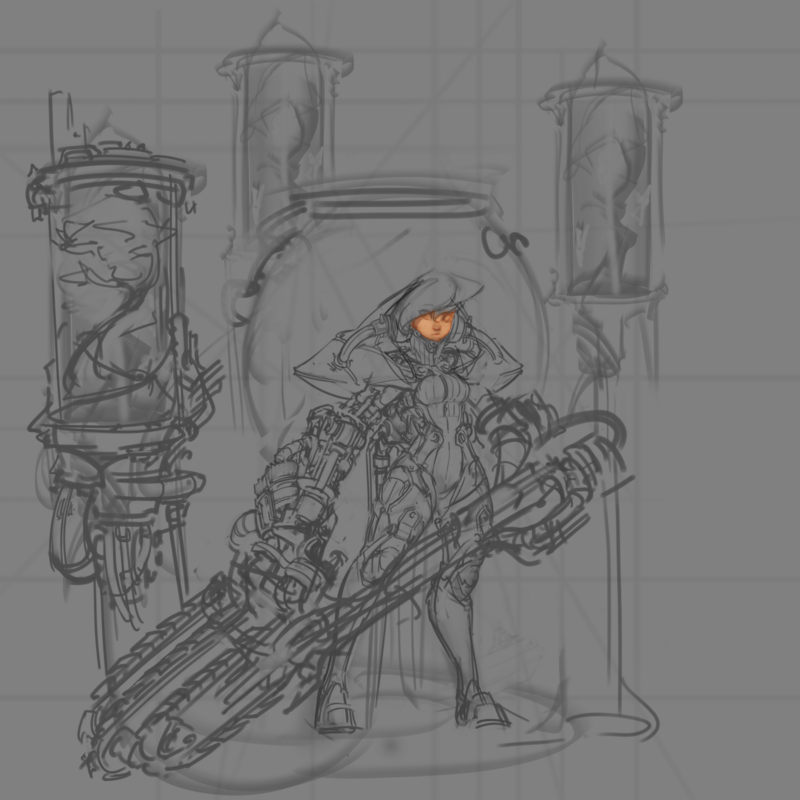 Actually at first I thought about going for a "Petite elf-like girl (cowl and bow to support that) protecting something light and magical from black gooey menace, but eventually settled for a massive triple chainsaw contraption for a weapon for her. Took next couple of weeks off job to focus on the contest, hopefully 17 days will be enough for what I'm going for. Char design update - will probably clean up a linework and add rough colors, but most design decision will be made on the illustration itself. Concept sheet will be updated along the way. 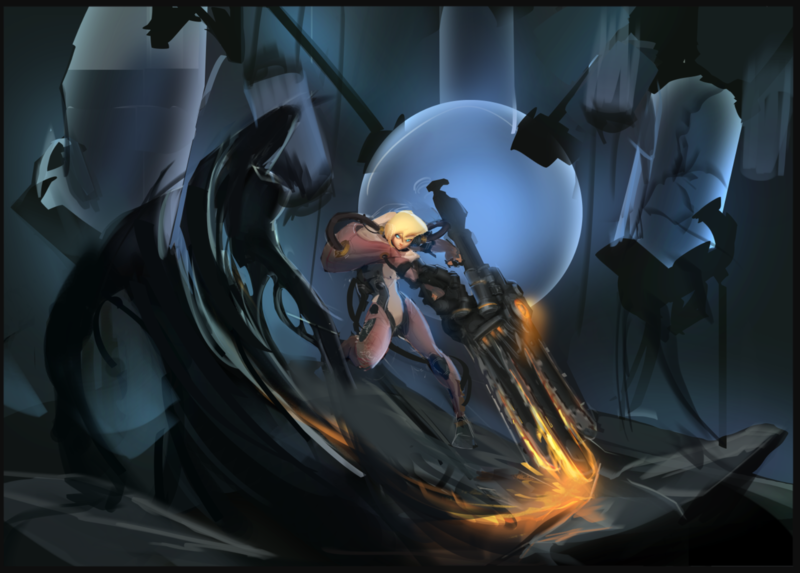 And here's the composition I'm happy with atm. Things may change, but a decent starting point. Not sure how readable these sketches for anyone but me, but future updates hopefully will be more clear in it's intent Will try to update every day or two now. What the hell man. The is looking really badass!!! The design is looking epic so far. Really nice shapes and aggressive look to the character. 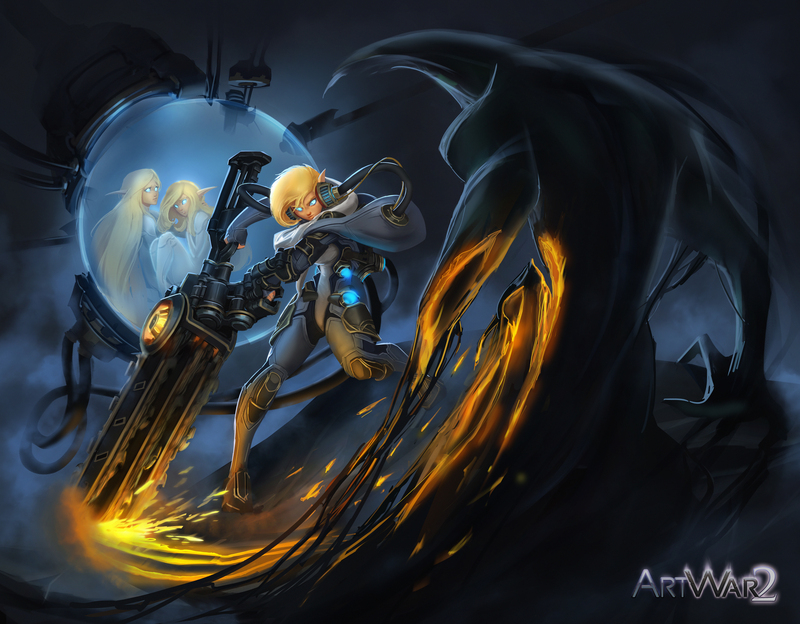 You gotta share your references with me lol I wanna make badass characters like this as well. 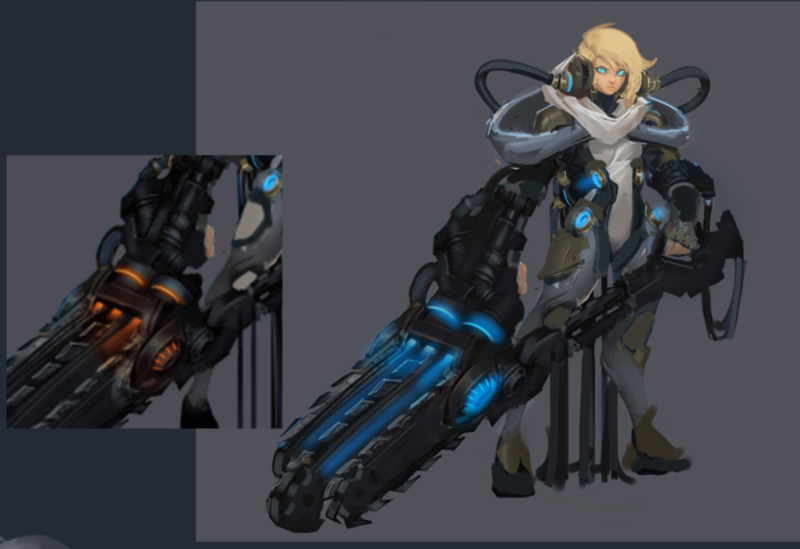 The weapon idea and look is awesome. 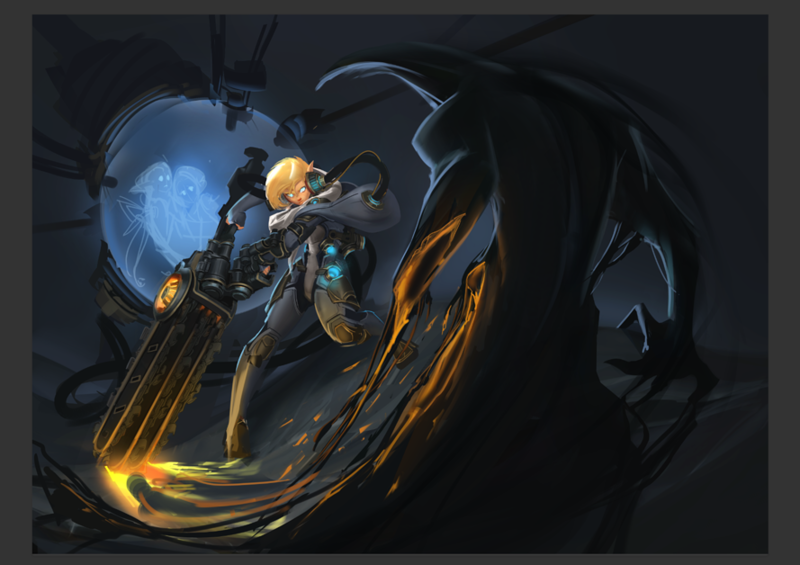 Tell me if I'm wrong, but in the illustration wip, it looks like you have your character Destroying her dark enemy by cutting them down with the chainsaw weapon. Not sure if you'll put it in the final, but some kind a swipe and a smear effect on the chainsaw would be cool. To me that indicates the force behind the strike and how powerful the character is. Not needed at all but just a recommendation. @malcom thanks mate! Will try to organize references for the next update (pureref). Regarding FX for weapon attack - dynamism probably will be achieved through dynamic enemy chunks flying all over the place, also sparks and pebbles flying from the place of impact. Smear effect - most likely. 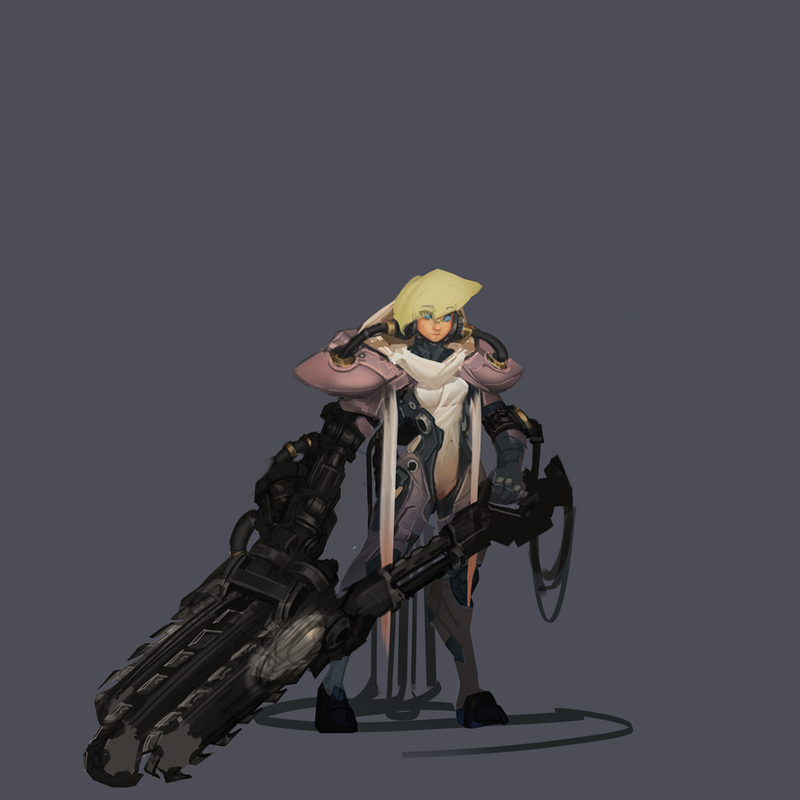 Character rough color and overall compos. Not happy with the face atm, but need to be moving on to the illustration, will be finalizing colors and important features there. Concept will be updated along the way. The character feels really fresh and new. 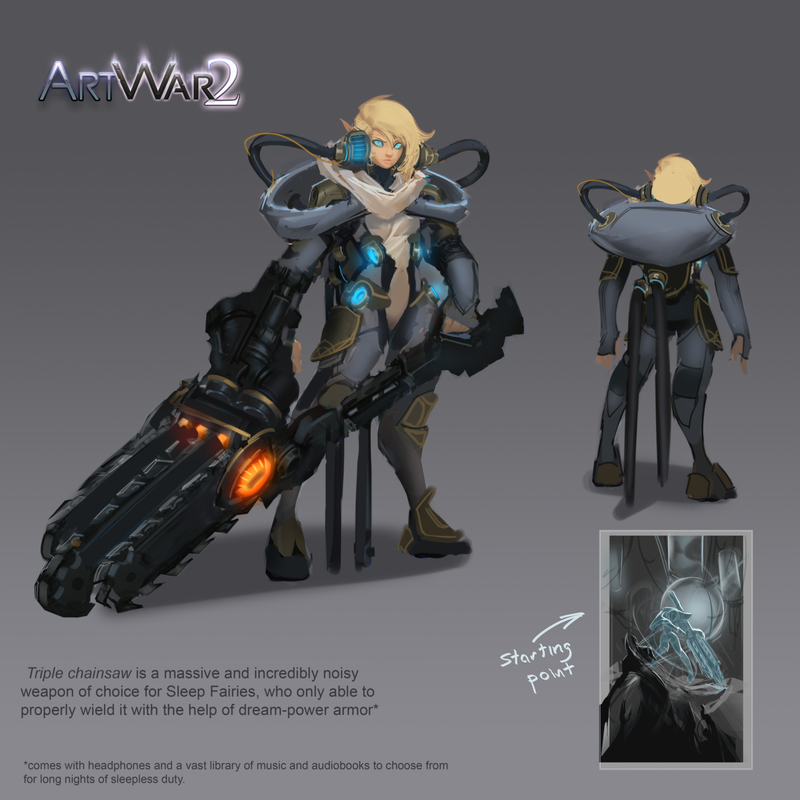 The idea of the vfx coming from the enemies sounds good. I look forward to further updates. Some minor updates - roughing everything in. I prefer to define character face as early as possible - helps moving forward as an additional motivator to finish the piece. 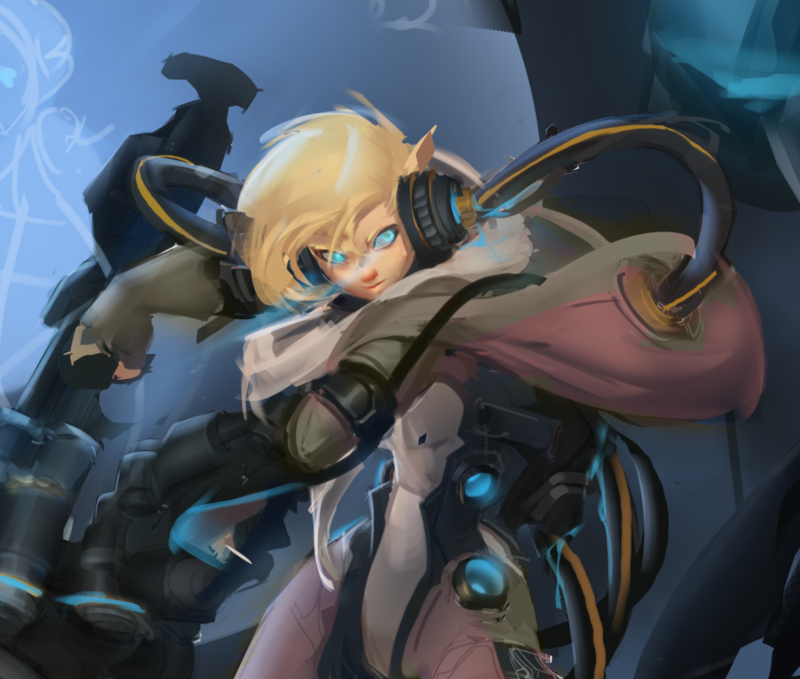 Current canvas - will focus on fleshing out the character and deciding on the final composition for the next update. I meant to comment on this sooner but man is the badass. I think the yellow hair works really well to draw us in. The sparks coming from the chainsaw are really cool as well so far. Keep it up. 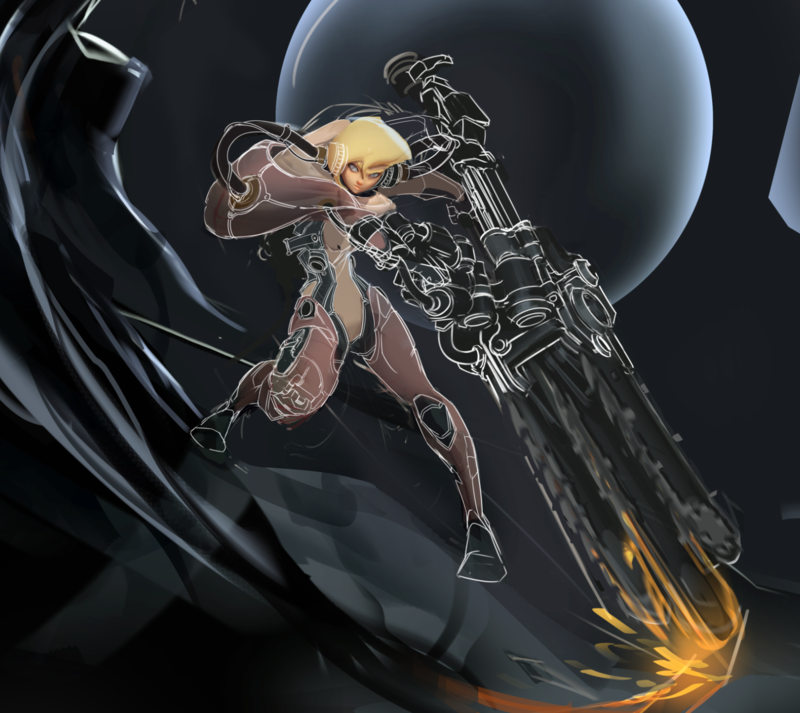 ... and an Illustration wip. Colors are starting to set in. Not very happy about how the chainsaw lost the cutting "swoosh", will need to fix that. Some updates. Still a way to go. I really like the change fore the hair. It gives the scene more motion. The added elves in the scene sell the idea of protector. The blue accents on the suit are a nice addition as well. Keep going bro . You got this. @malcom not going to give up! Thank you for your support. Adjusted initial concept according to the illustration - fun part about allowing yourself to wander. Detailing will be pushed further eventually, but for now - trying to decide between red and blue flame for chainsaw motor. With the design changes, I'm liking the blue here. It gives that "good" warrior vibe or warrior of light vibe. The blue can also serve as an good story element. It can say some about the tech in her world. The orange is also nice because it has a realistic touch to it. I think because of her role, the blue might be the better choice. 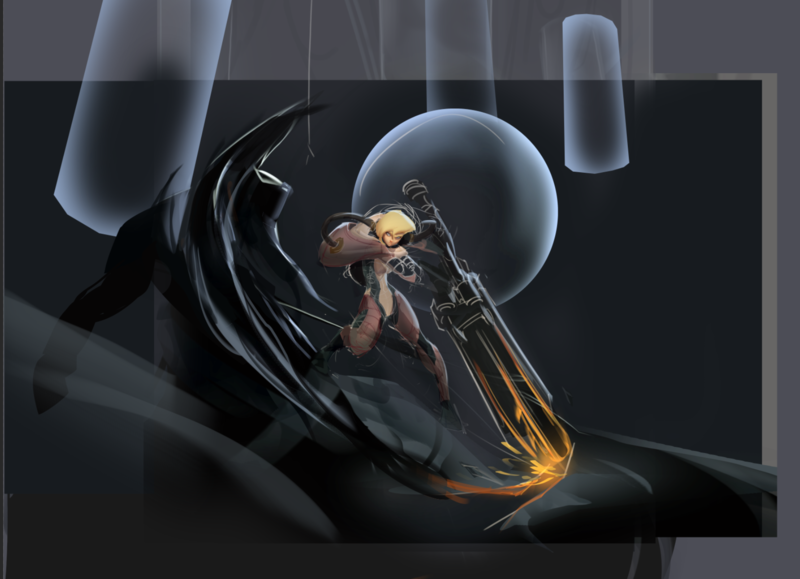 But looking at the latest illustration wip, the colors being orange work to help the scene color break up. Nice complimentary colors going on with the orange an blue. Hard call to be honest. Hope this kinda helps. the new design is still aesthetically pleasing. I like the face a lot. Edit: I think the red/orange flame might contrast the best due to all the blue on her body. Just a thought. ok enough rambling. This is looking good. Best of luck on choosing and keep up the good work. @malcom , @katya_cyan thanks guys! 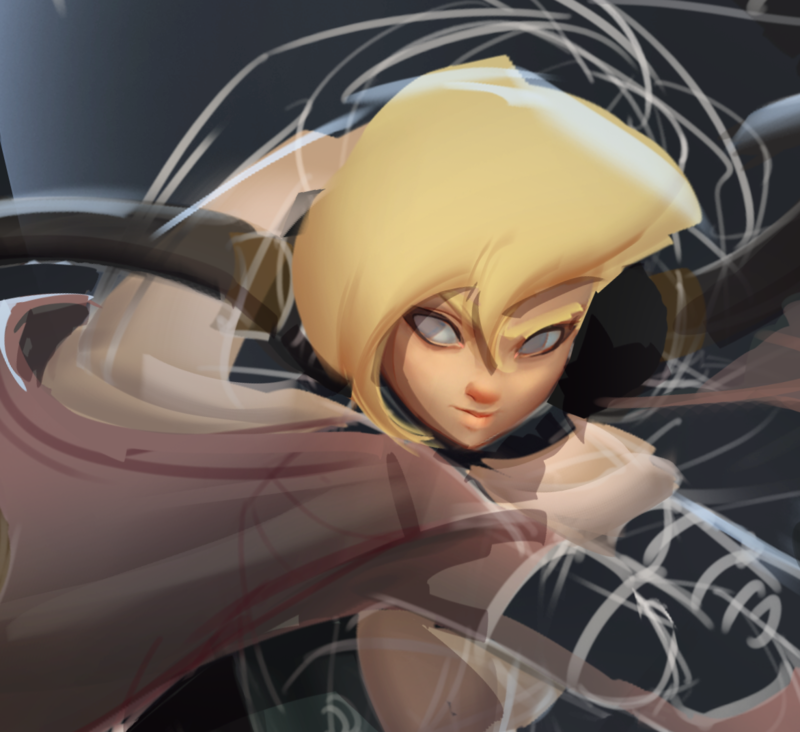 A render pass or two is still ahead along with a bit of overall balancing, but getting there.